2 What’s the big deal? It’s a fact: Heat illness can kill you. 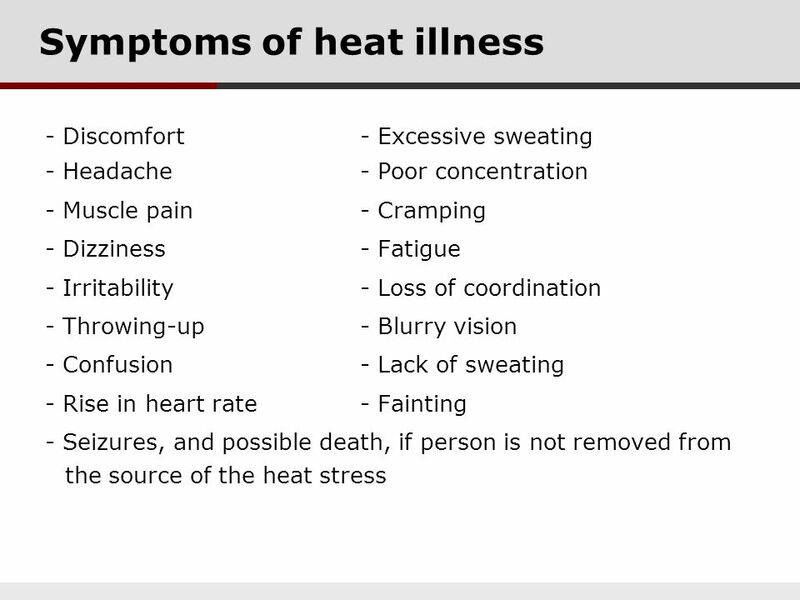 As the outdoor temperature climbs, so does your risk of heat illness. 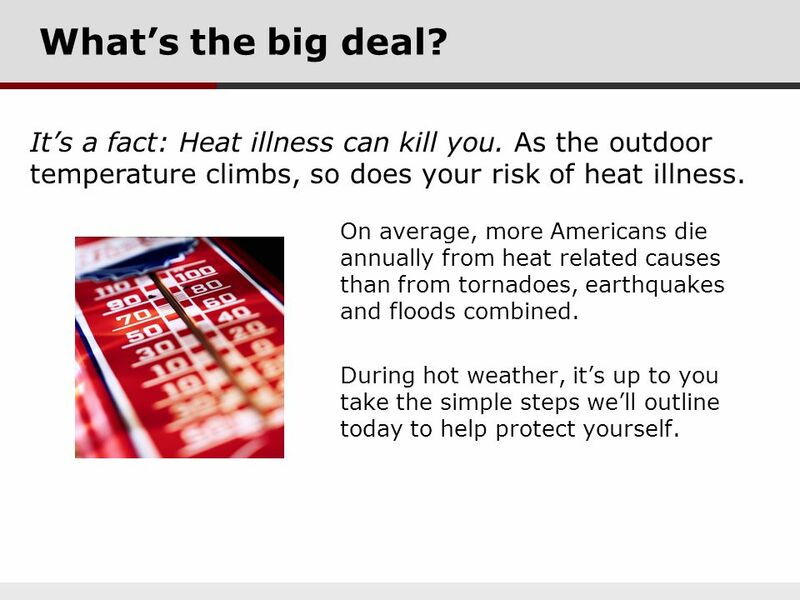 On average, more Americans die annually from heat related causes than from tornadoes, earthquakes and floods combined. During hot weather, it’s up to you take the simple steps we’ll outline today to help protect yourself. 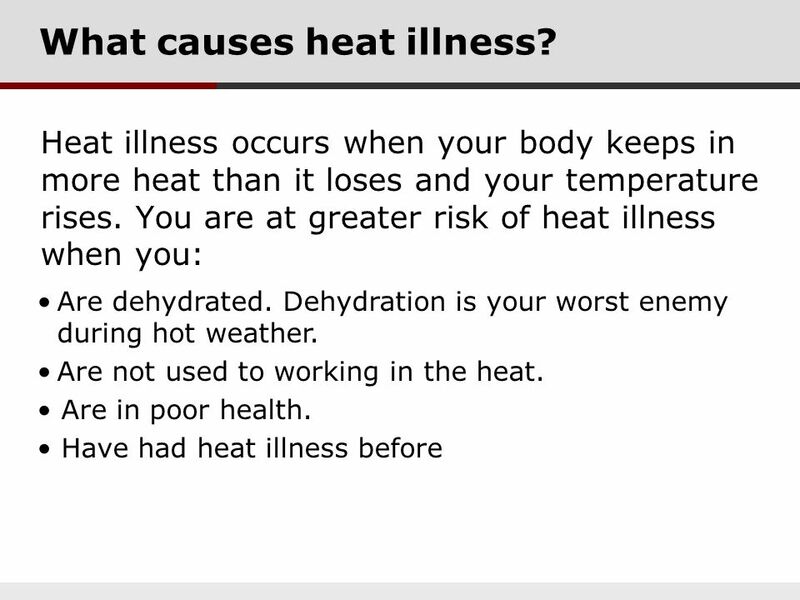 3 What causes heat illness? 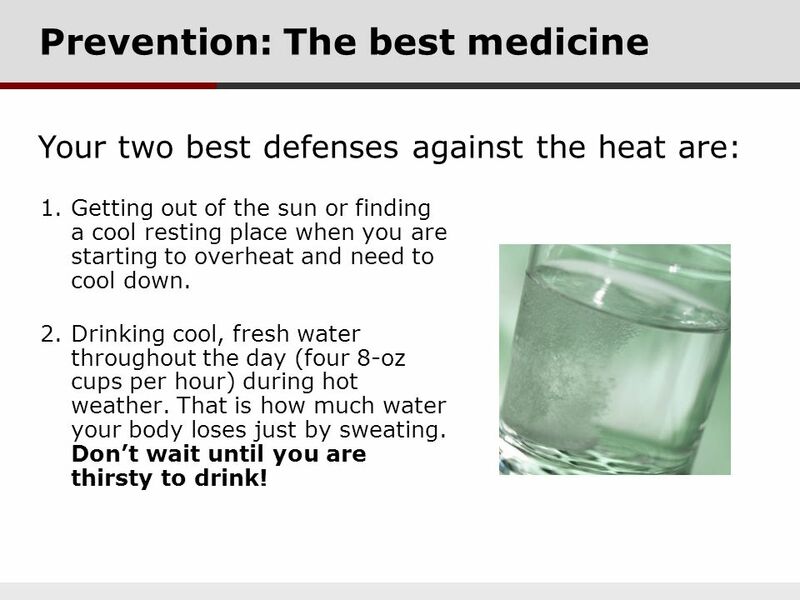 Your two best defenses against the heat are: Getting out of the sun or finding a cool resting place when you are starting to overheat and need to cool down. Drinking cool, fresh water throughout the day (four 8-oz cups per hour) during hot weather. That is how much water your body loses just by sweating. Don’t wait until you are thirsty to drink! Know the location of your closest drinking water supplies. Choose water over soda and other drinks containing caffeine or sugar. Never drink alcohol to hydrate. The more alcohol you drink, even beer, the more dehydrated you will get. Always know who and how to call for help when you start a new work day. Wear light-colored, lightweight clothing and sunglasses, and apply sunscreen. Keep track of your coworkers. You all need to watch out for each other. If anyone looks ill, check them out. 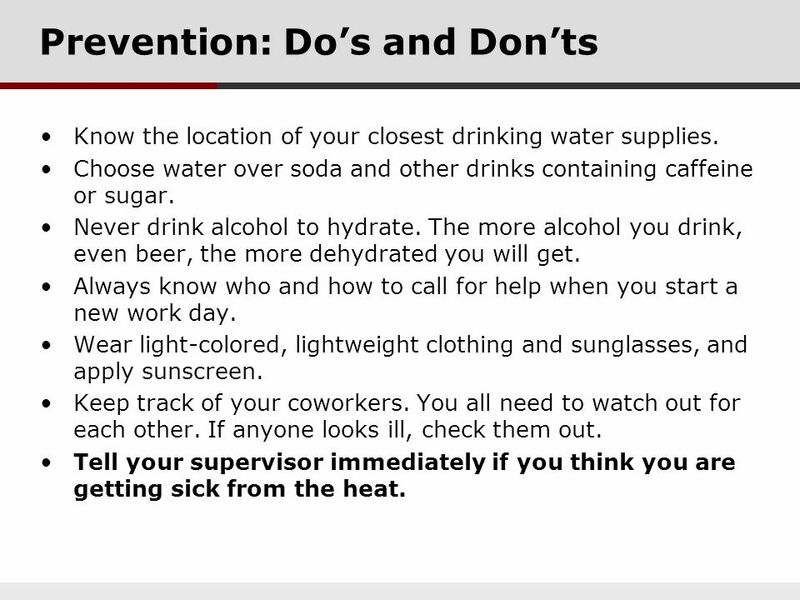 Tell your supervisor immediately if you think you are getting sick from the heat. 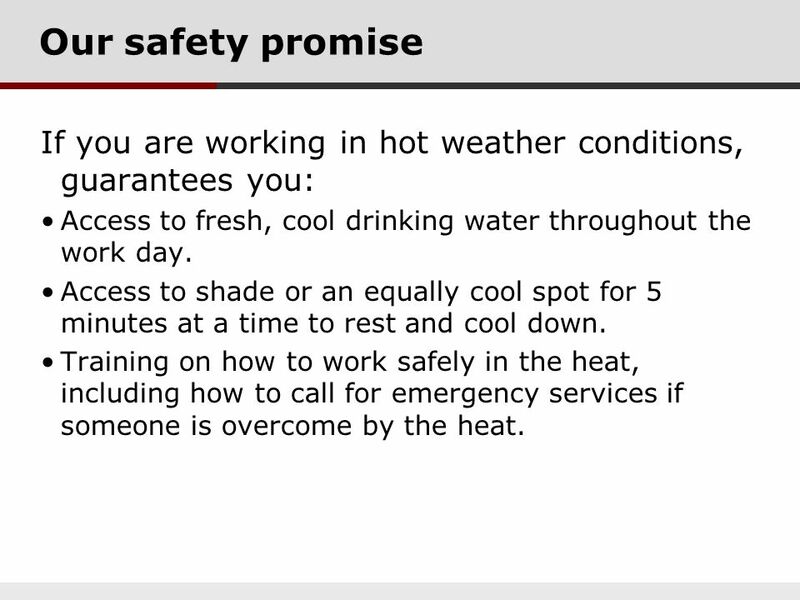 12 Our safety promise If you are working in hot weather conditions, guarantees you: Access to fresh, cool drinking water throughout the work day. Access to shade or an equally cool spot for 5 minutes at a time to rest and cool down. Training on how to work safely in the heat, including how to call for emergency services if someone is overcome by the heat. 13 Questions? Regardless of the outdoor temperature, your safety is always our top concern. 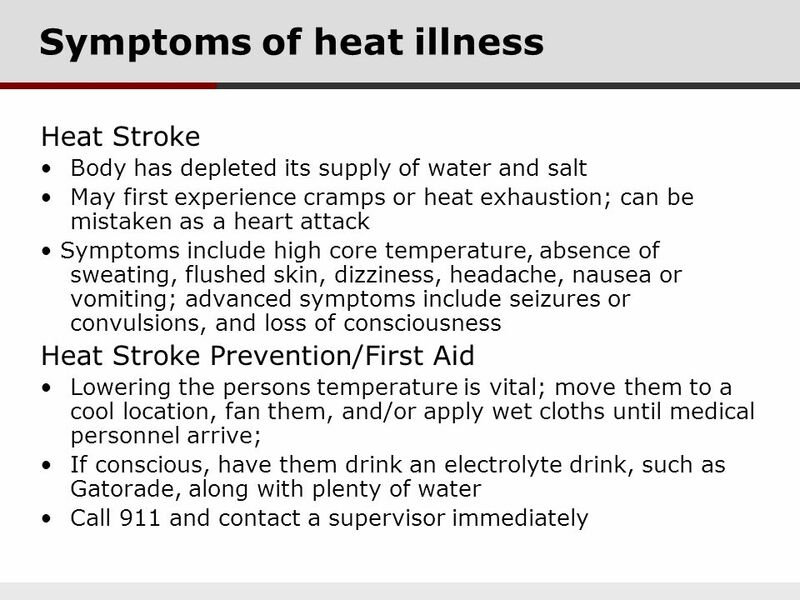 For more information about preventing heat illness or other safety concerns, consult with your supervisor! Sources: Cal/OSHA; U.S. Department of Labor Fact Sheet No. 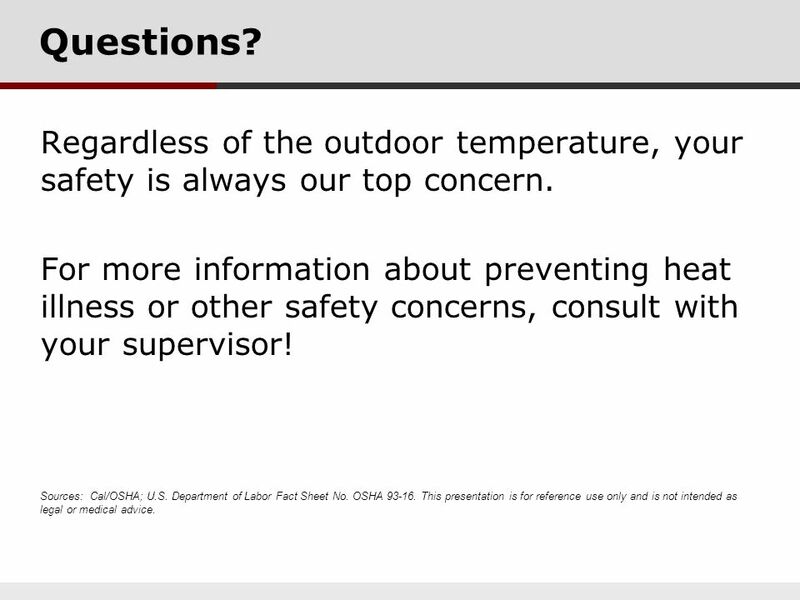 OSHA This presentation is for reference use only and is not intended as legal or medical advice. 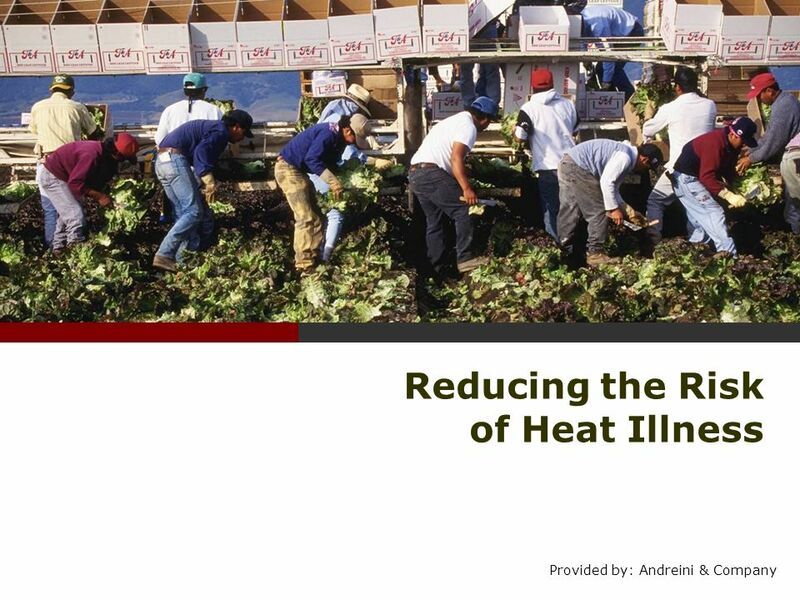 Download ppt "Reducing the Risk of Heat Illness"
Caltech Heat Illness Prevention Program Caltech Environment, Health, and Safety Office. 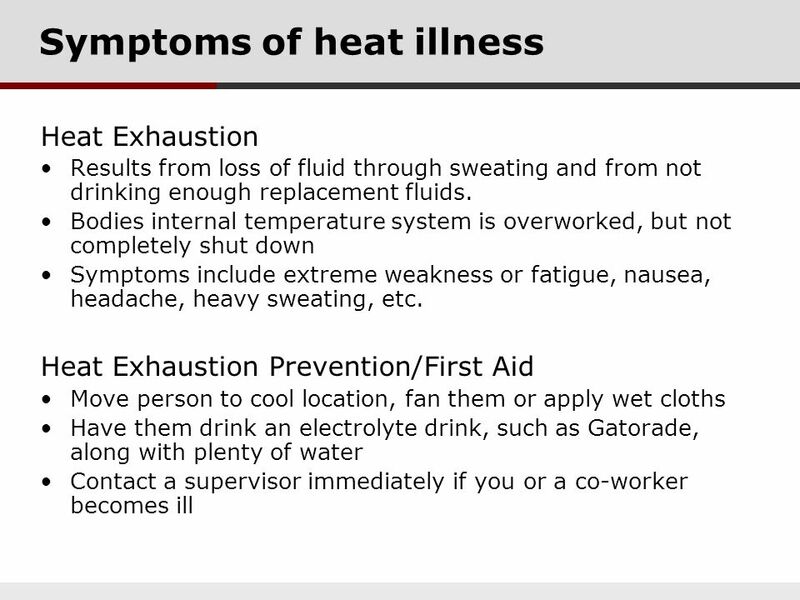 Workplace Heat Illness Prevention RIT-59 Revision A 08/28/2013. HEAT STRESS PREVENTION EHS Department. Heat Stress Why A Serious Health Concern Due to the high temperatures and humid conditions EPA states that approximately. How HEAT puts Stress on your body. PRESENTATION GOAL: TO HELP YOU UNDERSTAND THESE ITEMS: 1.Your body’s handling of heat 2.Hot environments increase likelihood. Copyright  Progressive Business Publications Blue Ridge Safety Association Safety Presentations Heat Stress. 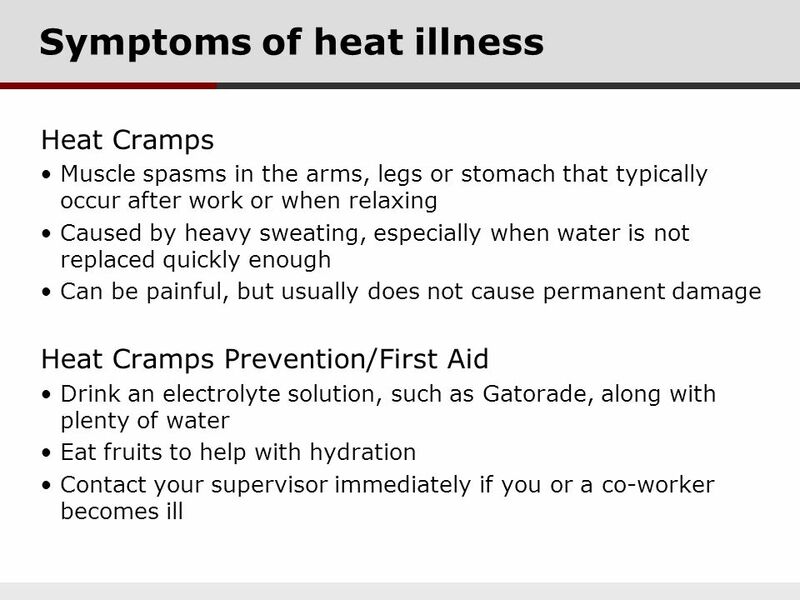 HEAT EXHAUSTION Treatment: * Get out of the sun to a cool spot and drink lots of cool water, a little at a time. If you are nauseated or dizzy, lie down. HEAT STRESS. Prepared by Paul Young 2 Heat Sources Temperature Humidity Radiant Heat Air Velocity All of these have an effect on the human body and the. 1 Toolbox Talk Sun Safety Health Risks In Construction. The heat is on….. So Be Careful! Heat Stress BUILDING EFFICIENCY MIDDLE EAST What’s wrong with me ? I have a headache and I’m feeling exhausted & faint Work Stress Psychological Stress. Heat Illness Prevention. Introduction Many people are not aware of the risks of heat stress on their body When the body is unable to cool itself it is. Heat Stress Training Marching Band Members. 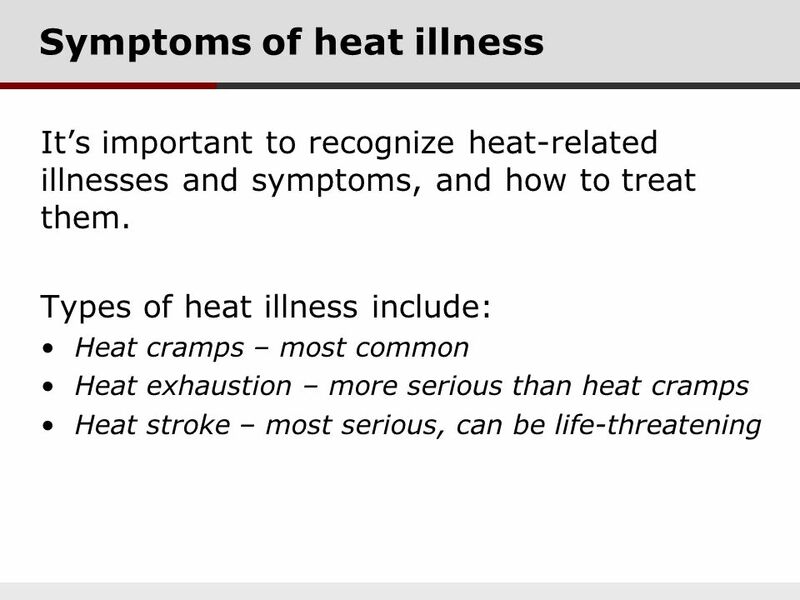 Introduction Heat-related health problems can be serious. Even when all efforts are made to ensure safe conditions. 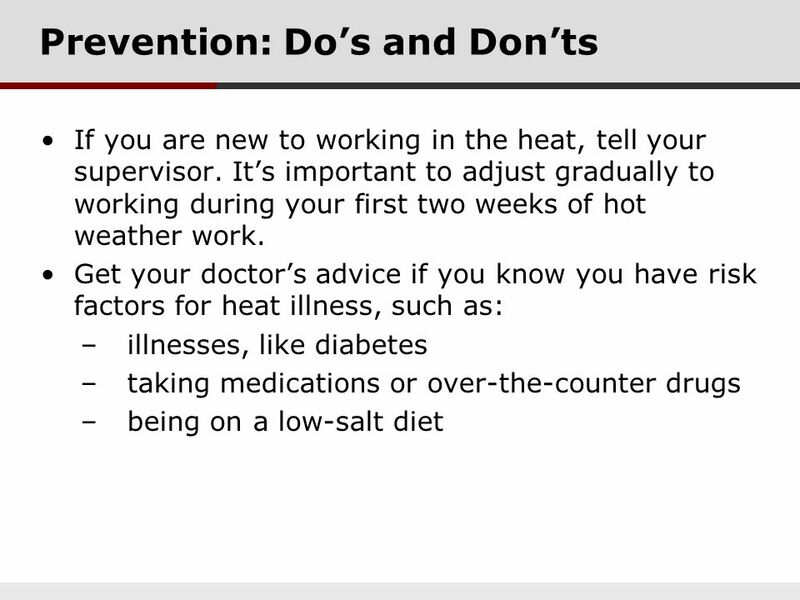 Heat Illness Prevention 2014 DOL Safety Training Stand Down Heather Martin, MSPH. Heat Stress. Agenda Definitions Regulation Responsibilities Hazard identification Risk Assessment. I.Heat Illness. A.Core Temperature: Temperature of brain, heart and lungs and abdominal organs. B.Shell Temperature: Temperature of skin and muscles Normal. Extreme Heat Safety. Extreme Heat What is Extreme Heat? ~ Temperatures that are 10 higher than the average for the area. Keep cool. Drink plenty of fluids.